Posted on Sun, Mar 11, 2012 : 5:23 a.m.
For the Ann Arbor Symphony Orchestra, March is a mad whirl. It brings a family concert, several youth concerts and a Saturday evening subscription concert, all in the space of a week. No complaints from orchestra or conductor, especially when the subscription concert, billed “Masterworks,” makes good on its title. Who: Ann Arbor Symphony Orchestra. What: Music by Daugherty, Saint-Saens and Tchaikovsky. Where: The Michigan Theater, 603 E. Liberty St. When: Saturday, 8 p.m., with pre-concert lecture for ticket holders at 7 p.m.
How much: $10-$55, with discounts for students, seniors and groups, A2SO, 734-994-4801, and online at a2so.com. 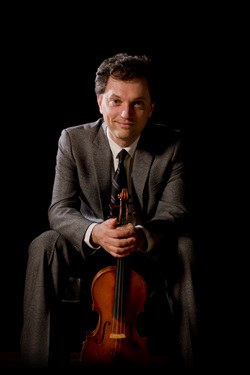 If the concert features a work by Daugherty, a celebrated University of Michigan composer, it also features another local star: A2SO Concertmaster Aaron Berofsky, like Daughtery a distinguished member of the U-M faculty, is the soloist in the Saint-Saens. Meanwhile, Berofsky, who was the soloist on the A2SO Naxos CD of the Fetler Violin Concerto, feels lucky to play this particular concerto. “I adore this concerto and feel it is quite special,” Berofsky said in an e-mail. “There is a sense of extreme calm, pleasure, intimacy and exquisiteness in parts of each movement. It is subtle music. "These are aspects of French Romanticism to me, which Saint-Saens is wonderful at conveying. They differ from German Romanticism, or Russian, and a French concerto for the violin is rare, while Germany or Russia are where many of our romantic concertos come from. With the Tchaikovsky on the bill, the concert, of course, also presents a major Russian Romantic voice. It’s a journey that Tchaikovsky, ever doubting his talents, wasn’t sure could please the audience. “Was he ever wrong,” Lipsky said. Mon, Mar 12, 2012 : 7:04 p.m.
actually an amazing concert! no typo! Looking forward to an amazing conbcert!